Turn off all system power before connecting speakers. Always wear protective eye wear when using tools. Wear gloves when working with fiberglass loft insulation. All applications apply for Ceiling and In-Wall speaker installation. The In-Wall and Ceiling speakers may be used in new or existing ceiling or wall installations to reproduce stereo music or home cinema surround sound. In this section, we’ll discuss a number of tips and techniques to help you plan the installation and achieve the best sound performance from your speakers. In-Ceiling and In-Wall speakers have a uniform (hemispherical) dispersion and do not require special orientation for good sound. For stereo music listening, place the speakers in the ceiling or wall, to the left and right. Think of your listening area as one tip of a triangle with each leg of the triangle being equal. See speakers FL (front left) and FR (front right) in Figure 1 below. Place the speakers as close as possible to the two points they represent on the triangle. For surround sound the minimum amount of speakers used will be five. Three at the front, FL (front left channel) FR (front right channel) and C (centre channel) and two at the back, RL (rear left) and RR (rear right). The front three speakers need to be on a level plane as possible with your ears whilst in your seating position. This can either be achieved using in-wall speakers or the purpose built surround sound ceiling speakers which have angled drive units that point directly down to your listening position. 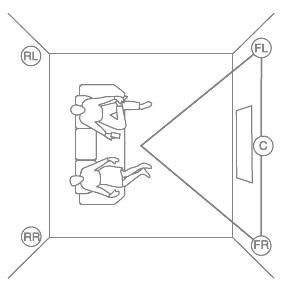 The two rear speakers need to be placed left and right and directly behind your seating position, see Figure 1 above. When designing ceiling speaker systems in a multi-room environment, an important goal is uniform sound coverage throughout the home. The goal should be to distribute the sound evenly in a way that will not interfere with conversation and general day to day activities. In rooms where listening to music isn't a primary objective (i.e back ground music) it is best to place the speakers around the perimeter of room. It is especially important not to mount speakers above dinning tables or seating areas so that people are not sitting directly under a speaker. In locations where the primary objective is to listen to music the speakers can be placed evenly left and right of the rooms main seating position as mentioned above. If you need further help with the placement of your ceiling speakers please call or email us. If an obstruction is found behind the plasterboard in the proposed location, you will need to choose a different location for the speaker. Before installing In-Wall or Ceiling speakers in pre-existing plasterboard, check for joists or any other obstructions, such as metal pipes, which are hidden from your view. The easiest, most efficient way to detect obstructions behind plasterboard is to use a stud finder. At each proposed speaker location, use the stud locator to find an open space. Try to centre each speaker between the joists. Slide the stud locator horizontally and vertically across the ceiling or walls to locate the joists or any other obstructions. At each speaker location, use the cardboard template to trace a cut line onto the ceiling or wall. At each location, drill a small hole in the plasterboard at the centre of the outline. Bend a piece of stiff wire (e.g. coat hanger) about 6 inches from the end at a 90 – degree angel. Insert the bent end into the hole and rotate the wire to check for any obstructions. If you hit anything, patch the hole with plasterboard filler and choose a different installation location. Using a fine – Plasterboard saw, carefully cut out each opening. When finished cutting, remove plasterboard scrap from hole. Strip the speaker wire with a pair of wire strippers. Carefully strip off 50mm of the outer jacket. This will reveal the conductor contained inside – two conductors for 2 conductor wire; four conductors for 4 conductor wires. Conductors are protected by a plastic, colour-coded insulation jacket that must also be stripped. Carefully strip 15mm of insulation off the conductors that you need. This will expose the copper wire contained within. You are now ready to connect the wire to your speaker. When connecting wires, observe the proper polarity of your amplifier (+) to (+) Red conductor (-) to (-) Black conductor also make sure that the left channel of the amplifier is connected to the left speaker, and the right channel is connected to the right speaker. For surround Sound, connect the speaker to the appropriate channel on the amplifier or receiver. Now connect the (-) and (+) conductors cables to the corresponding (-) and (+) speaker terminals. Gently pull on the wire to verify a secure connection. The easy and fast clamp installation procedure found on all the speakers that we supply, allows you to simply clamp your speaker in place. Remove the grill by gently pushing one of clamp legs toward the front of the speaker. They should lie in the full clockwise position so that all clamps lay within the speaker cutout. Insert the speaker into the cut hole bringing the outer edge flush with the ceiling/wall. Use a Philips screwdriver to tighten the four screw heads located around the front edge of the speaker. This will automatically rotate the clamps behind the plasterboard and securely grip your speaker flange to the ceiling/wall. When you notice resistance in the tightening of all four screws the speaker has been successfully sandwiched between the plasterboard and the speaker flange. The clamps provide a tight fit and prevent unwanted vibration. The screws should not be tightened so far that the flange bows, this will make the grill hard to fit. If this occurs, back off the tension on the screws a little. Gently push the speaker grill into the speaker baffle. Most of todays ceiling speakers have an adjustable tweeter arrangement, which directs sound toward or away from the listening area to achieve a desired effect. Press on the outside plate to aim the tweeter so it fires at a desired listening area. Orient the tweeter toward the listing area if the speakers are widely separated and the music fails to blend into a central image when the system is operated in stereo. Orient the tweeter toward the listening area when additional brightness is desired. Orient the tweeter away from the listening area if the music or video sound stage seems too narrow or restricted. Orient the tweeter away from listening area if it sounds too bright. For home cinema surround applications, orient the rear speaker tweeters away from the listening area so that the sound reflects off an adjacent wall or ceiling. This will help create the desired diffuse sound field. If you plan to paint your speakers, we recommend that it be done prior to installation. If you decide to paint your speakers sometime in the future, it is best to remove them by simply reversing the steps for speaker installation listed above. When painting the speakers, the paint masks provided in the box must be installed in place of the grille. The speaker grilles can also be painted. However, great care should be taken not to clog the holes, as this will greatly reduce the sound quality of the speakers. Before painting the grilles, remove the material from under the grille. Place this material back in place once the grille has been painted. The Custom Speaker Company recommends only light spray painting using 5 parts thinning agent to 1 part paint. Do not paint the grilles while they are attached to the speaker.